This week’s photos come from a crazy school fair. 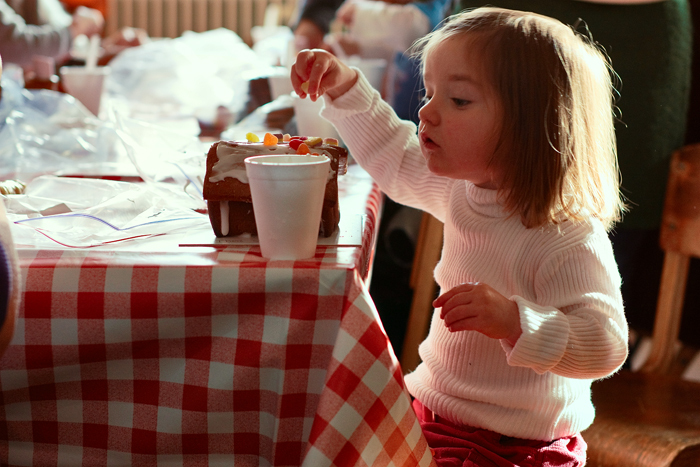 Unlike most school fairs that occur at the peak of summer, this one’s in the winter. I don’t know why. Probably so that you can partake in the delight of roasted chestnuts and listen to the deep, throbbing lull of the tuba around the camp fire (really). My mother lured me to it by promising that people would be prancing around in weird outfits and there would be mad-sights a-plenty. But… alas… there weren’t. Just normal-looking people going about doing normal things, like… talking… and eating food. 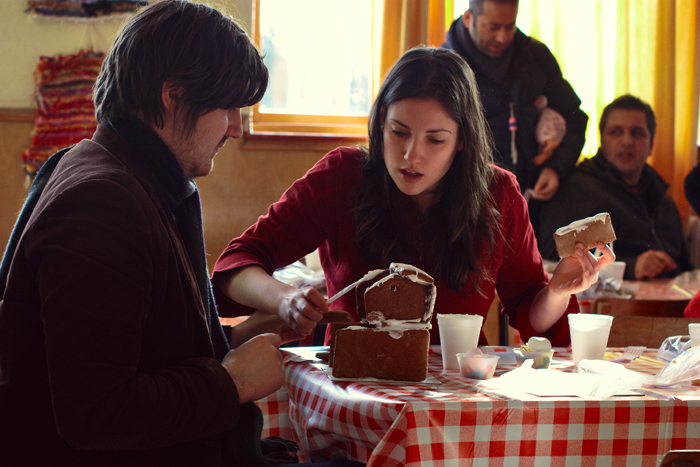 There was a fun little event however, where literally hundreds of children made gingerbread houses. You paid a few pounds and got given a bag of gingerbread slices, a pot of white icing and a cup of candies. You then had 20 minutes to fashion a house of gingerbread and tacky, ‘structural’ icing before you were man-handled out by harried-looking staff. The rooms (there were 3!) 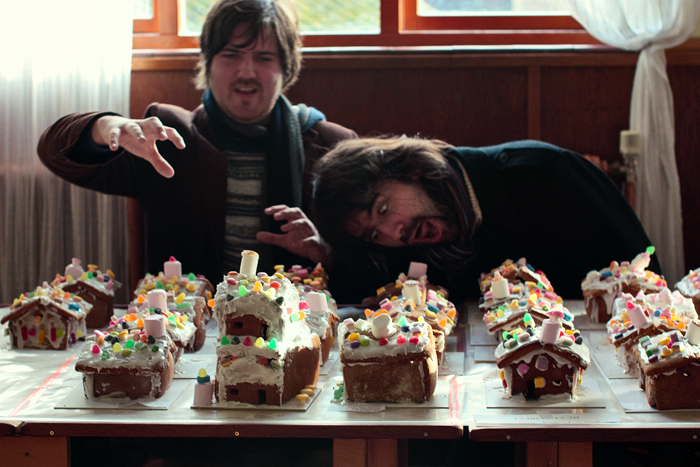 were then prepared for the next batch of keen gingerbread architects extraordinaire. All natural light/straight out of the camera, incidentally. The opposing windows made it rather hard to get a good photo actually. Lots and lots of reflected red/yellow light from the furniture/curtains/cakes — fun! The show must go on! Just... not today. That’s a lot of sticky! Sounds like work is going really well, which is cool. Always reassuring to hear happy stories from the Land Of Freelance. I know that this is not a caption competition but I am having to restrain myself from adding one or two here. As I have already told you, I love these. Nice work!. See you back at the crack den!. The AOL job isn’t really freelance, I guess. Or, I can leave at any time… but there’s no invoicing-and-praying, which is nice! 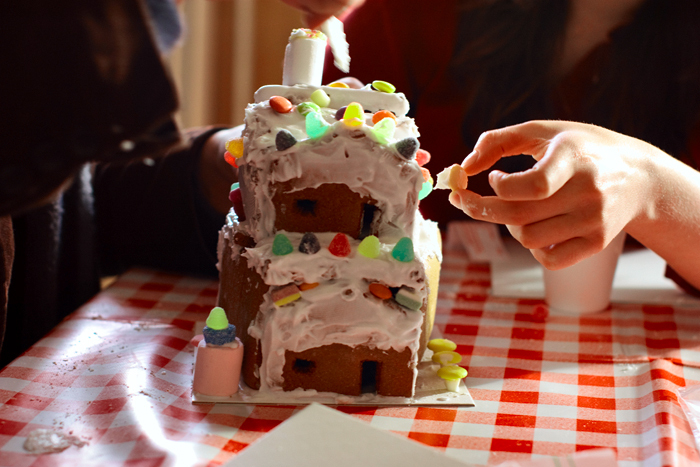 Is it just me or are gingerbread houses kind of gross? I’ve never done one and refuse to buy the supplies to let my kids do one- they just seem so damn messy. Like I’ll have ants for months searching for the vat of sugared up “glue”. Yuck. I’d totally eat the candy though. I need no holiday for that. I am seriously considering photoshopping out the background of the final picture because it is genius. But… what would you DO with it, Nico…? Actually, email me the answer to that question. I’ve eaten very little gingerbread myself, Sara. We have ‘gingernut biscuits’ which are kind of… gingery, crunchy cookies, but actual gingerbread I’m not a fan of. I love, love the last one. Made me laugh out loud. 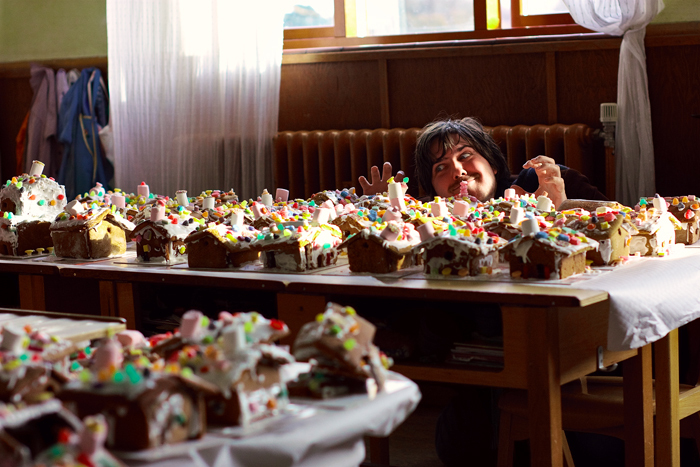 I love gingerbread houses! We used to make one every year–my mom would bake the gingerbread and construct the house, my brothers and I would put on the candy, and after Christmas we’d have friends over for a gingerbread-smashing party where we’d eat it (it was quite a large gingerbread house compared to the ones in your photos). My mom’s gingerbread was very good, but then leaving it on display for a couple weeks naturally made it a bit stale by the time we ate it. But her gingerbread men and women–a softer gingerbread to start with–are delicious. Nice photos. That little girl is adorable, clearly creating a work of art. Photoshop out you in that last photo, pair it with… my stockinged leg? I’ve clearly been missing out on gingerbread men and houses all these years! I recall the occasional gingerbread man from the local bakery… they were OK. Nothing special. Must’ve only ever had a few of them in my lifetime though.